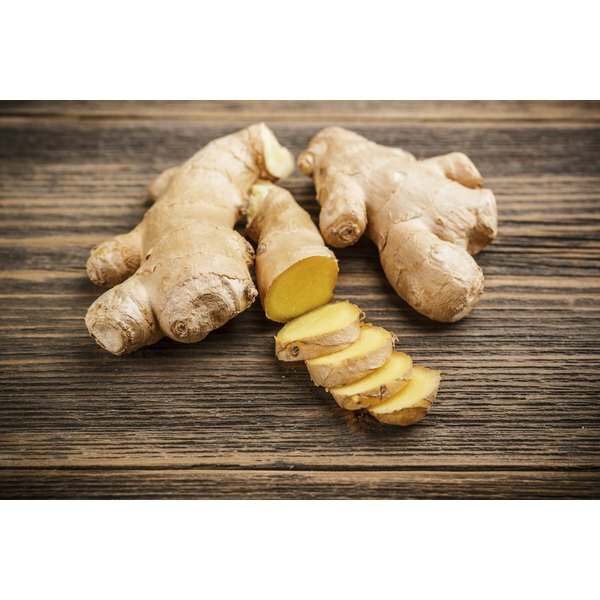 Ginger root is the rhizome, or fleshy stem, of a tropical plant. It’s a vegetable but is usually treated as an herb or spice for cooking and medicinal purposes. The fruit is the seed-bearing part of a mature flower. Other parts of a plant, including the roots, stems and leaves, are considered vegetables. That means that ginger, which comes from the stem of the plant rather than from its flowers, is a vegetable. The leaves and flower buds of ginger, available in some Asian markets, are also edible. For ginger that is less fibrous, choose roots that are slim and thin-skinned. Although it can be stored at cool room temperature, ginger keeps longer if you seal it in a plastic bag and refrigerate or freeze it. You can peel it with a vegetable peeler before grating, dicing or mincing it to add to soups, stir-fries, fruit salads and other dishes. Fresh, unpeeled ginger slices can be steeped in boiling water to make a tea. LiveScience.com: What's the Difference Between Fruits and Vegetables?